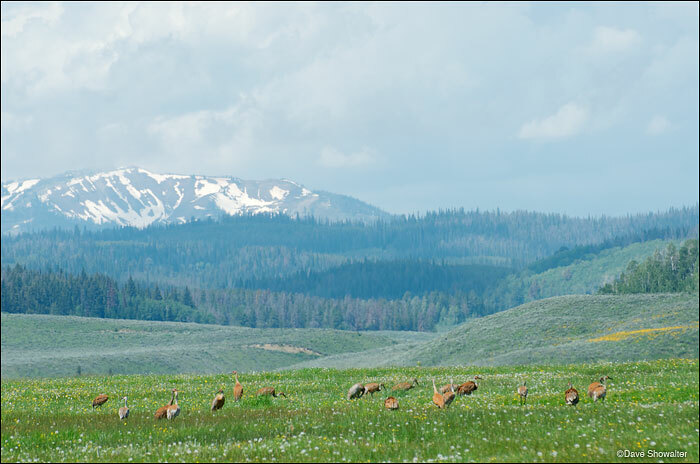 Sandhill cranes feed in a summer meadow with a backdrop of the mighty Wyoming Range. Greater sandhill cranes mate, nest, and raise their young in the Greater Yellowstone Ecosystem before migrating back to New Mexico for winter. This area could be heavily impacted by a proposed industrial gas field in the Upper Hoback River - Noble Basin. Grus canadensis. Photo © copyright by Dave Showalter.